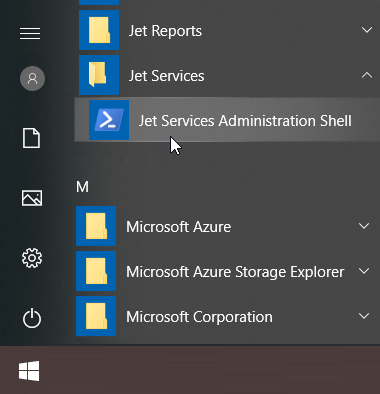 The Jet Services Administration Shell (a PowerShell management module) can be used to manage the settings for the Jet Service Tier and create/maintain the certificate bound to Jet Hub. The available MSI file can be used (with the Windows Installer or other installation tool) to install the Administration Shell into the appropriate “Program Files” directory. Along with the Administration Shell, the MSI also installs the service assemblies and a shortcut in the Start Menu (to access the administration shell). You access the tool by using the shortcut called “Jet Services Administration Shell”. This must be run as administrator and will open an instance of PowerShell. This command will generate a new self-signed certificate using the given parameters and installed it to LocalMachine\My and LocalMachine\Root. It will return the SHA1 Thumbprint of the newly created certificate. CommonName: Used for the Issuer and Subject. SubjectAlternativeNames : Will allow the certificate to be used for TLS connections. Bind: Will bind the newly created certificate as the SSL certificate for the Jet Service Tier. PS> New-JetServiceTierCertificate -CommonName "// JST Cert \\" -SubjectAlternativeNames "localhost", "127.0.0.1", "DESKTOP-BTRSLHE"
Shows all JST certificates thumbprints generated and installed by the New-JetServiceTierCertificate command. This command will delete the specified JST certificate from LocalMachine\My and LocalMachine\Root. It will only delete the certificates generated and installed by the New-JetServiceTierCertificate command. This command will display all or just the specified JST setting(s). This command sets the specified JST setting. Changing some settings will require the restart of the JST for the change to take effect. The command will prompt the user to confirm the service restart. Valid NetTcpPort/HttpsPort port range is 1024 - 65535. The command will also validate the specified port is open before setting the value. The -ForceSave parameter will force the saving of the -HttpsPort or -NetTcpPort values regardless if those ports are currently open. Indented to facilitate unit testing but it can also be handy in some unusual developer cases. The Jet Service Tier will not be functional until it is restarted. Restart the Jet Service Tier? Set-JetServiceTierSettings : The specified port 7090 is not available.